Latin America comprises around 20 countries, which can be subdivided into four regions based on their geographical position: North America, Central America, the Caribbean and South America. As of 2017, Latin America accounts for about 8.53 percent of the global population, and is home to 643 million inhabitants - less than Europe, by the way, despite its larger geographical area spanning from Mexico to Cape Horn. The predominant languages spoken in Latin American countries are Spanish and Portuguese. Tourism represents one of the primary contributors to Latin America’s GDP. The region’s aggregated gross domestic product amounted to approximately 5.5 trillion U.S. dollars in 2017, and tourism and travel industry contributed almost 400 billion U.S. dollars that year. Total GDP generated by the Latin American travel and tourism industry is expected to rise to around 700 billion U.S. dollars by 2027. 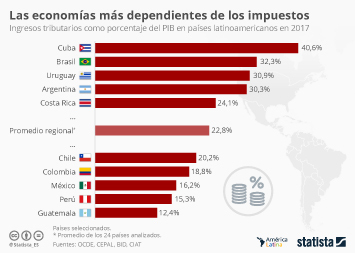 Regarding inflation, Latin America is wedged as an average between the EU and all other regions of the world. In 2017, people living in Latin America had a quite high average life expectancy at birth, one of the highest life expectancies at birth in the world. However, substantial differences in the population figures can be observed across the countries. They are a direct result of variations in fertility levels and health care provisions. Recently, Latin America was among the major areas of the world where a high adolescence birth rate was observed; today, one of the major health risks Latin American countries are facing is an infection with the Zika virus, which can pose serious health problems for mothers and their new-borns. Additionally, Latin America is one of the regions with the highest crime rates worldwide. Out of the world's 50 most violent cities, 41 are in Latin America alone – the highest homicide rate being found in Caracas, Venezuela, with about 120 homicides per 100,000 residents as of 2015. The violence and the nature of these crimes can be mainly attributed to drug trafficking, gang warfare and political instability.